Athena is one of the world's best Lady Gaga Impersonators and has been endorsed by Lady Gaga Herself. 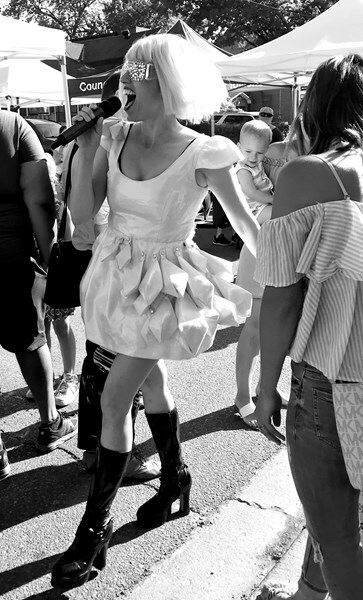 She also performs as Cher, Alanis Morissette, Celine Dion, Marilyn Monroe, Madonna & more. In 2016, Chatelaine Magazine called her the World's Top Lady Gaga Impersonator and NY Magazine called her a Best Bet. In Feb 2015, Billboard Magazine printed a picture of Athena, thinking it was Gaga. And a few days later Athena was featured in Page 6! (This was Athena's 2nd mention on Page 6). And in June 2015, the Wendy Williams Show used Athena's image, thinking it was Gaga's. On August 5th, 2014, Gaga tweeted in support of Athena's show, "Lady Gaga: #ARTBIRTH". And, earlier that year, while at SXSW in March 2014, Gaga was quoted as saying, "She (Athena) can use my image whenever and however she likes". Athena is often mistaken for Gaga by paparazzi and fans and has been featured on page 6 of the NY Post. Athena was featured on Gaga's Edge of Glory Google commercial. As seen on Let's Ask America, CNN, Lifetime & more. She is an award winning singer & actress whose voice sounds identical to Gaga's. She plays piano, has authentic costumes, professional dancers and is wonderful to work with. She also does others such as Marilyn Monroe, Celine Dion, Madonna, Katy Perry, Joan Rivers, Bette Midler & more. 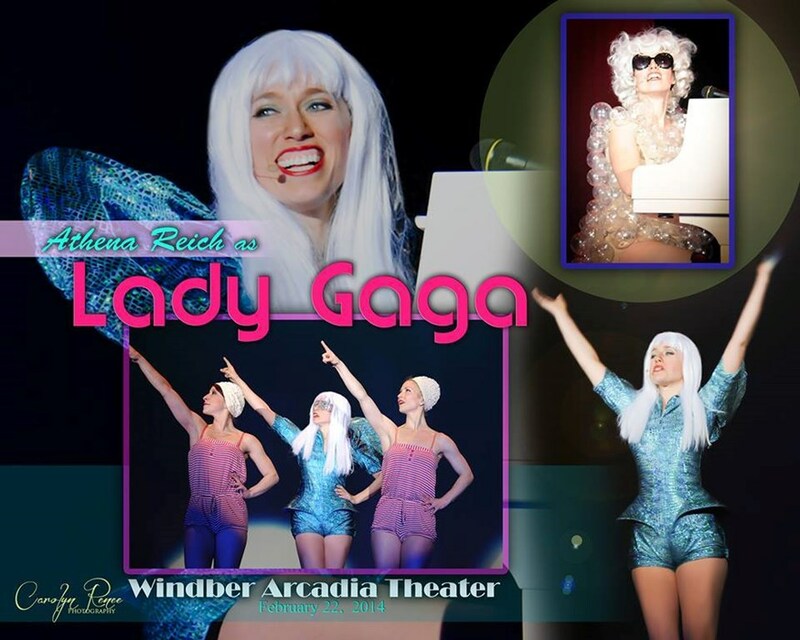 "World Renowned Lady Gaga Impersonator Athena Reich" (Washington Times) is a true talent. She sings live (does not lip sync), dances and has professional back-up dancers. Athena does children's parties, corporate events, colleges, clubs, trade shows, product ambassador work & weddings. Ask about Pregnant Gaga for baby showers! She was selected by Lady Gaga herself to appear in Gaga's National Google Chrome Edge of Glory commercial. Athena has appeared on CNN, MTV, PBS and more. Athena is an award winning singer/songwriter & actress. She is professional, reliable, reasonable (she can provide her own sound system) and loads of fun! She travels anywhere in world. Athena performs 2-12 Gaga songs and performs solo or with back-up dancers. Unlike most other impersonators, Athena has an incredible voice and does not lip sync. She sings all of the songs live and plays the piano, just like Gaga. Her back-up dancers are professional dancers who do the real Gaga choreography. She can headline a festival, private party, night club, or walk the red carpet as Gaga! She is generous with the crowd and loves making time for photographs and autographs. She is an incredible singer and performer and can get any party up off the floor, dancing, and having a great time. At trade shows you can count on her to draw the crowd to your booth! She works with all ages and groups. Her charismatic and sweet personality sets her apart from the rest. Athena travels internationally. 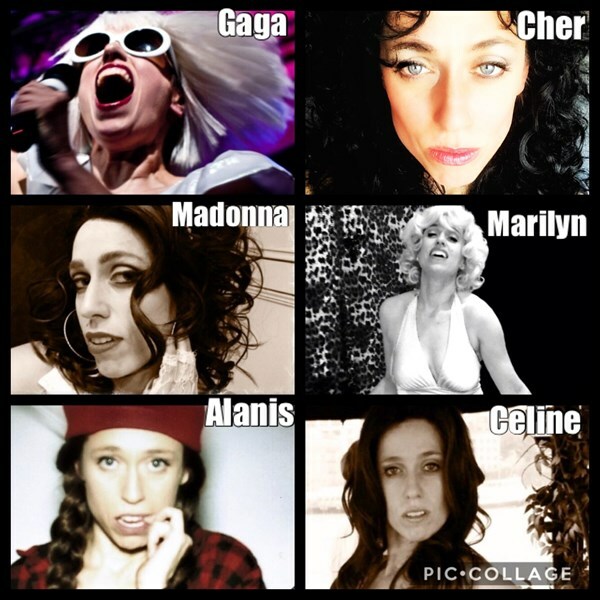 Marilyn Monroe, Lady Gaga, Madonna, Celine Dion or Cher at your event! Personalized Video Message for special someone. Lady Gaga for your event. Celine Dion for your event. Please note Gaga, Marilyn, Celine, Cher & more - Athena Reich will also travel to Oakwood, Downsview, North York, Weston, Willowdale, Etobicoke, Fisherville, Thornhill, Concord, Scarborough, Woodbridge, Maple, Richmond Hill, Markham, Mississauga, Kleinburg, Locust Hill, Brampton, Gormley, Springbrook, Whitevale, King City, Oakville, Pickering, Ajax, Nobleton, Stouffville, Bolton, Brougham, Hornby.